Need a baby shower gift idea? Hurry and get the Bright Starts Playful Pinwheels Bouncer today for only $17.84 from Amazon – Regularly $32.99! Save 46%! This is the lowest price ever on Amazon. Limit 3. Check out all of the recent Amazon deals here!. 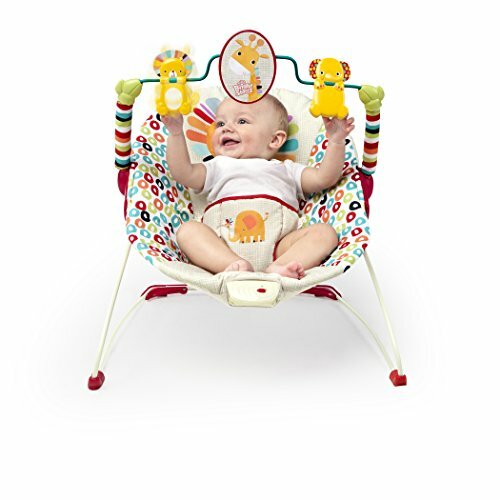 This bright and playful bouncer will keep baby comfortably cradled and entertained. The playful pinwheels bouncer from Bright Starts is adorned with vibrant colors and playful characters that your baby will love. The soft, cradling seat pampers baby with plenty of support and comfort. Soothing vibrations and interactive toys keep baby calm and amused. The toy bar removes with one hand so you can access your baby with ease. Machine-washable seat pad and adjustable 3-point harness. Buy the Bright Starts Playful Pinwheels Bouncer from Amazon.As always, Amazon Prices can change quickly. If the price is up, the deal is simply over! Be sure to join our Daily Email Newsletter so you never miss out on the best daily deals.